Mercè Alsina (Barcelona, 1966), independent curator and art critic, has a BA in Geography and History with specialization in Art History from the University of Barcelona (1991); a Postgraduate Certificate in Cultural Management and Heritage from the European Heritage Centre, History Museum of the City, Barcelona (1992) and a Master of Advanced Studies in Art History from the University of Barcelona (2012-14). Alsina is a member of the Catalan Association and International Association of Art Critics (ACCA i AICA); currently secretary of the board of the Catalan section. She was responsible for the audio visual programming of the contemporary art space E.M.V.ART.HORT and author of several culture documentaries for television. She has been a commissioner for over one hundred exhibitions, among which her time as director of the gallery ARTUAL and artistic director of the Gallery 44 in Barcelona, as well as the series “Convergence in the range” of Museu Abelló in Mollet del Valles, among others. 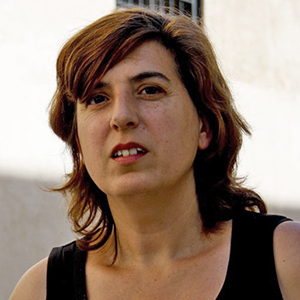 Along with Carmen Ortiz, she published the website “Critical Wall” (www.murcritic.org), an information platform with documental resources of art and contemporary thought. She directs the courses of the Catalan Association of Art Critics, “Exhibition Curation and Assembly” and “Art Critic.” Professor of the Master in Design and Direction of Exhibition Projects and the Master in Exterior Design. Events and Ephemeral Spaces of the Pompeu Fabra University and ELISAVA School of Design. She has also been a professor for the Master in Publishing from the University of Alcala, Madrid.